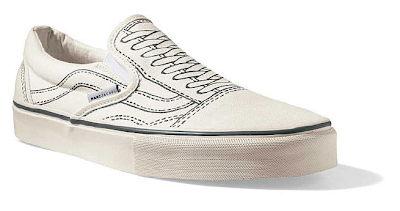 Marc Jacobs is fast becoming the King of Collaborations and although he's been creating Vans since 2006, I haven't liked most of them until these two pairs from his Vans X collection. 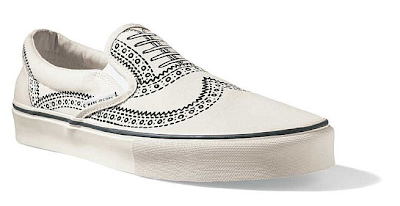 The line art of a traditional perforated leather saddle shoe and that of a classic tennis shoe printed on a plain natural canvas pair of Vans turn these casual slip on shoes into witty pieces of art. And while you're at it, read a nice article on the history of Vans at Sneaker Freaker here.